This variety bag includes a mix of 80 fun size skittles original, starburst original and life saver 5 flavor big ring gummies fun size pieces. 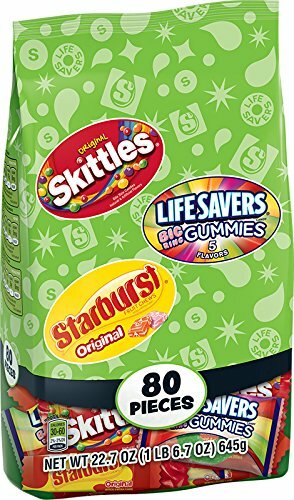 This assorted candy mix is perfect for Halloween trick or treating, parties and snacking.80 skittles original, starburst original and life saver 5 flavor big ring gummies fun size pieces perfect for Halloween, parties and snacking. Taste the rainbow with skittles original fruit flavors; orange, lemon, green apple, grape, and strawberry. Starburst original-the strawberry, cherry, orange, and lemon flavors that started it all. Life savers big ring gummies come in cherry, watermelon, strawberry, green apple, and blackberry flavors. Bag includes a total of 80 individually wrapped fun size packs.